The barrel program at Boatrocker is really coming into its own now, with time, the acquisition of more oak and a growing inventory of liquids of various forms and ages giving Matt Houghton and his team an ever-broader palette from which to draw. And, if the 2018 Indies beer awards are any guide, it's one that's delivering great results too. As well as taking out the Champion Medium Brewery trophy at June's awards, the brewery also snaffled two Champion Beer trophies, one for Ramjet, the storied barrel aged imperial stout, and another for Daddy Koel. The latter of these is so called as it started out in the brewery's koelship – or coolship – with the wort left outside the Braeside brewery on a cold winter's night in 2016 to pick up the flora and microbes indigenous to the area. Then it was transferred to barrels to continue its evolution. The result is a liquid that has a density to its appearance; not in the oily manner of, say, a big stout, but more crystalline. In a way, it's a precursor to what lies ahead as this is a beer for which the word intense could have been intended. The label talks of tropical aromas and a playful acidity, but we'd argue it's the latter of these that's the star of the show; sure, there's a sweetness suggestive of its age and tonnes of oak character, but it's the acidity – textured and lingering long, long, long after your last sip – that makes this beer such a pleasure, balanced by just enough (intense, of course) sweetness. 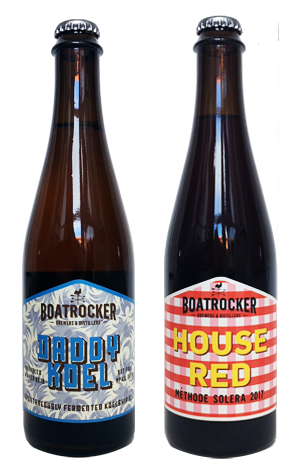 Joining Daddy Koel in the Boatrocker lineup at the mid point of winter 2018 is House Red, a beer with a title that plays down just how much has gone into it. This is no simple drop, but a sour red that's a blend of 12, 18, 24 and 48-month-old beers. It pours a rusty, rustic red and, while malt sweetness plays a role, this beer is perhaps best described as a showcase of the other. Move over hops, this is a place where lactic and acetic acid and various Brettanomyces yeast strains get to have fun, concocting acidities (yes, plural), dryness, dried fruits and dark berries, sourness and tang.